All text and photographs by the Author unless otherwise stated. I recently looked at three Racing Champion Mint models from 2017 but here we go back a year further into the past to the earlier releases by Round 2 after they were licensed to produce this range by Tomy. The same ‘3.25 inch’ fit the box sizing applies as it did with the 2017 models with all the models shown here being pretty much the same length. 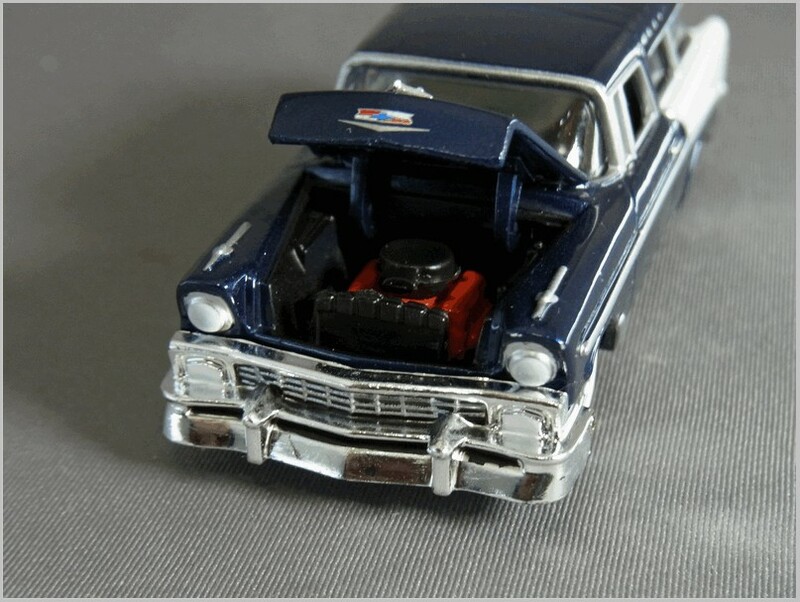 All were diecast in China for the US. The Riviera first entered the Buick line in 1949, as the designation for the new two-door pillarless hardtop, described in advertising as “stunningly smart”: the Buick Roadmaster Riviera coupe. 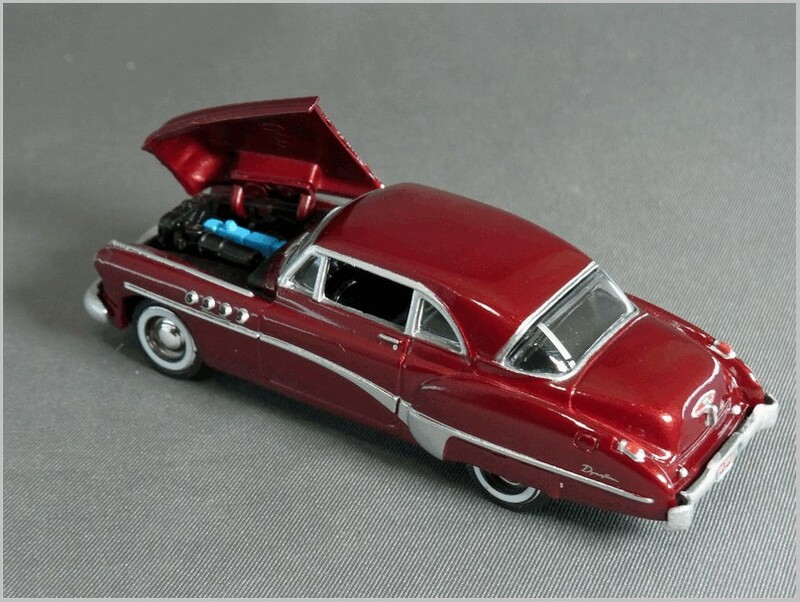 It was also in 1949 that Buick introduced “VentiPorts.” Four were displayed on each of the Roadmaster’s front fenders, with three on the fenders of models with smaller engines. The Riviera joined the line up in the middle of the year selling 4,314 units. Featuring power windows as standard equipment, the 2-door Buick Roadmaster Riviera was among the first hardtop coupes produced. The Riviera was also notable for its popular optional “Sweepspear” chrome body side moulding, which would soon become a Buick trademark. The “Riviera trim”, as it was initially called, was also made available on the Roadmaster convertible very late in the model year. 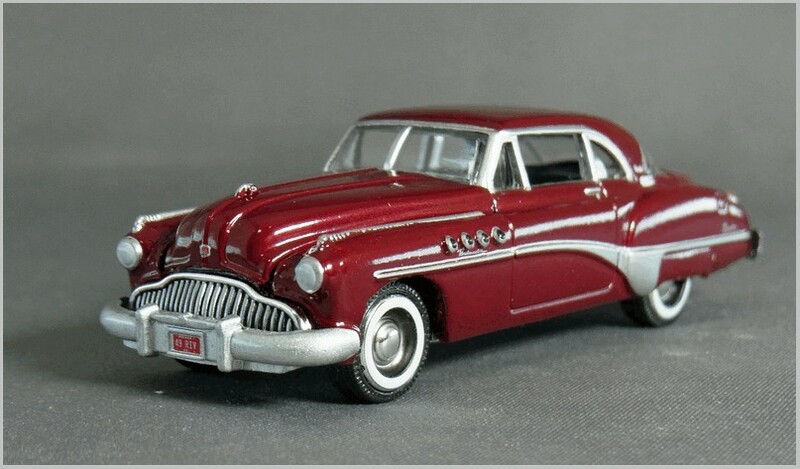 The model captures the rounded lines of the Buicks of the late forties well. 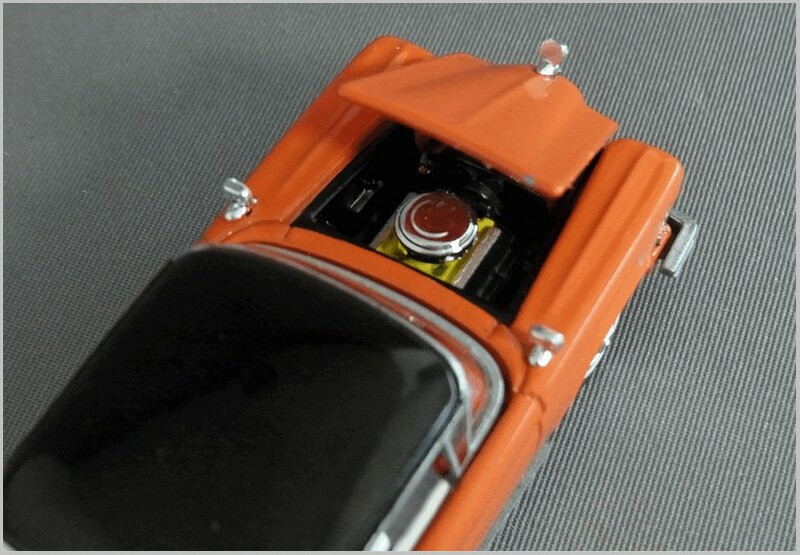 Note the excellent flush fit of the windows into the diecast roof. The interior has moulded dashboard with quite a bit of detail as well as seats but no door card mouldings. At the front the huge ‘grinning’ grille has been well captured. Above it the printed badge is only visible in detail when the photo is enlarged but it is an impressive tiny multi-colour print. The huge bumper has been perhaps exaggerated a little in size and the small number plate looks very small. The chrome printed objects extend to the fittings in the top of the wing. The chrome printing is a little flat and could do with being a little shinier. Like other Racing Champions the front lights have been painted in white which works well here. To the rear the window fits snugly and printing represents the multi-part screen well. The boot handle is surrounded by a lovely printed Dynaflow badge and the Dynaflow script is also printed neatly on the rear wings. where the rear lights are moulded in the casting and accurately over-printed high on the wing. Another slightly heavy and rather dull bumper with a tiny license plate. Two reversing lights are moulded in and highlighted by printing silver on them. Finally the play components. Only the bonnet opens but this fits well and opens sideways in a realistic way. The engine detail is limited but it is clealry powered by the inline eight rather than the V8 that was to dominate in the 1950s. The original Nomad was the shortest GM offering with a two door body and an estate car rear it was meant to combine sportiness with practicability and it had gathered much favourable comment when originally show as a styling exercise at Motorama in 1954. 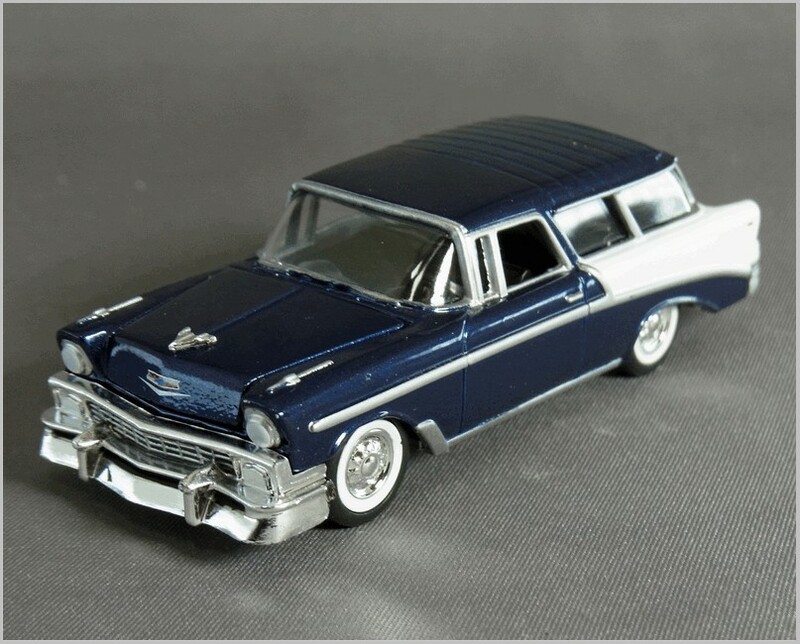 Though it has been widely featured in films, and is certainly regarded as a ‘classic car,’ it did not sell well enough for GM and from 1958 onwards Nomad was just a badge on the larger Chevrolet Impala Station Wagon. When the Nomad was introduced in 1955 it reflected the new styling across their ranges. Nomads, like Bel Airs, came fitted with interior carpet, chrome spears on the front wings, chrome window mouldings, and full wheel covers. A V8 engine option was offered using a new 4.3 Litre OHV engine. In 1956 Chevrolets received a face-lift. This gave Chevys a more conventional full-width grille as fitted to this model. 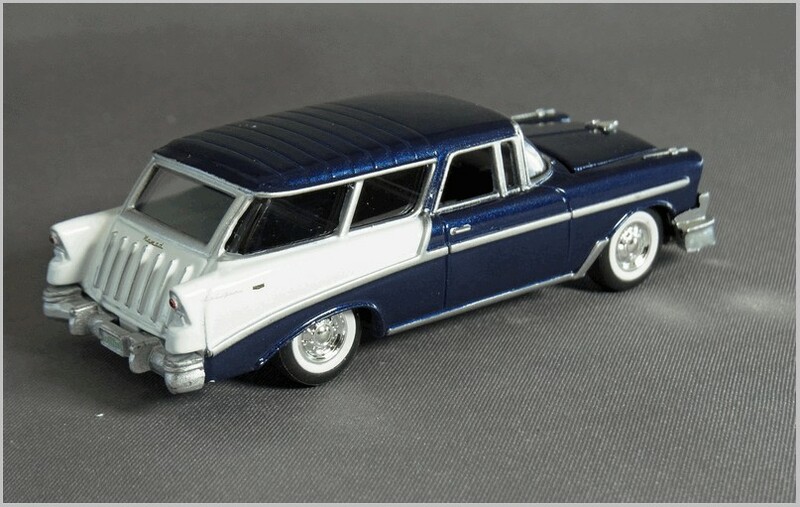 In 1957 the Nomads was changed again and they were fitted with the same interior and rear-wheel pressings as Bel Airs, lacking the original Nomad’s unique trim. The model captures the short length and the unique Nomad rear roof section, windows and painted rear section. The wheels are a reasonable representation of the original wheels even if the tyres are slightly too square shouldered and wide. The Chevy badge and Nomad scripts are printed very finely on the rear wing. The windows and their chrome fittings along the side, and the front door with its forward facing B pillar, are all well represented. The interior again is a black plastic moulding with a moulded dash and steering wheel with some detail , seas and floor, and in this case the ribbing of the carrying compartment detailed but again it has no moulding on door cards. From the front the 56 front end with its full width grille are captured well and there is even a black wash on the grille making it much more convincing. 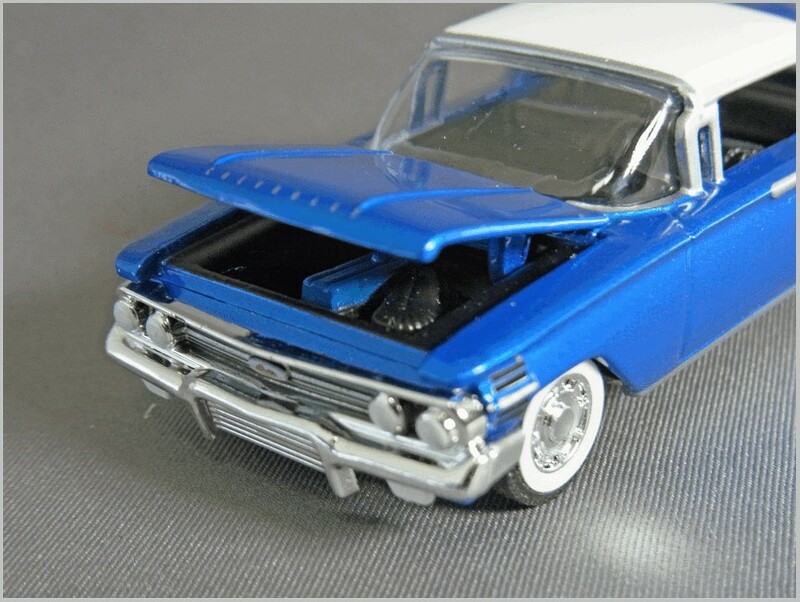 Headlights and sidelights are both painted white which contrasts well with the ‘chrome’ The Chevy badge is printed nicely on the bonnet and the bonnet ornament with its aircraft influences is reproduced neatly. To the rear the small Nomad script in gold is printed above the chrome strips on the rear half of the rear tailgate. 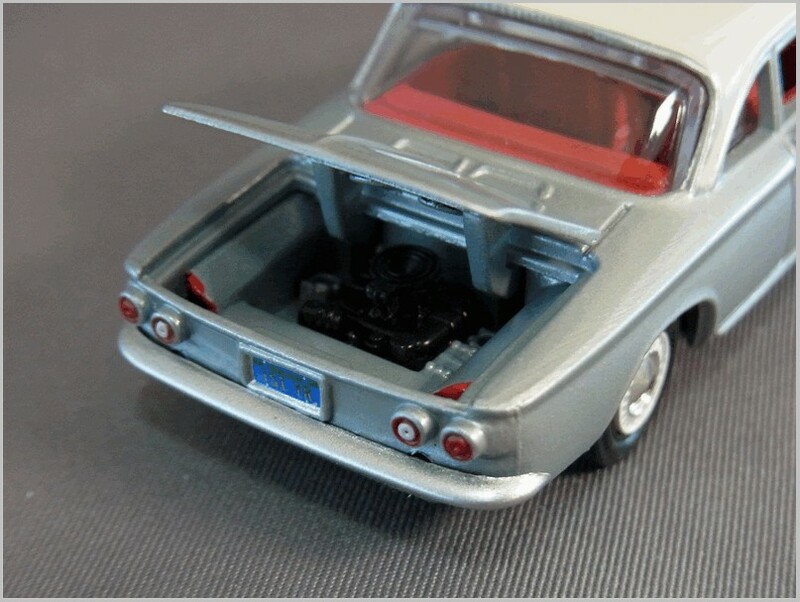 The rear lights are neatly cast in and overprinted chrome and red to give a good effect. The rear bumper is rather dull and slightly heavy but follows the lines it should. 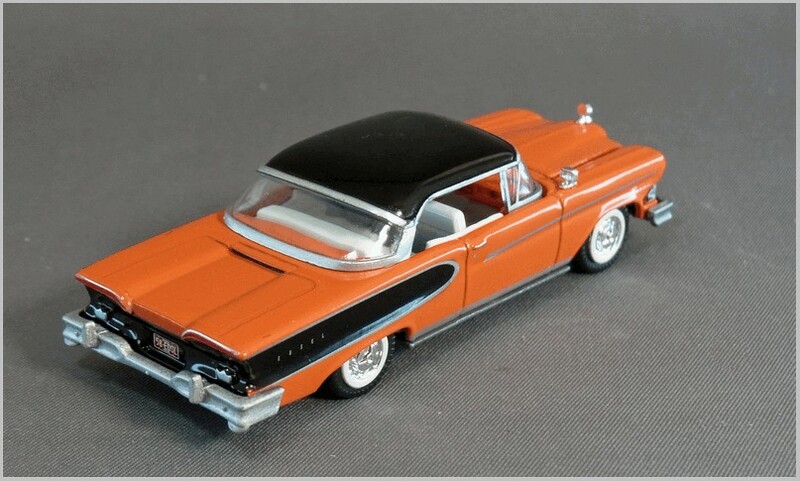 Again an opeining bonnet is the only play feature on this model. Under it lies an impression of a V8 engine. 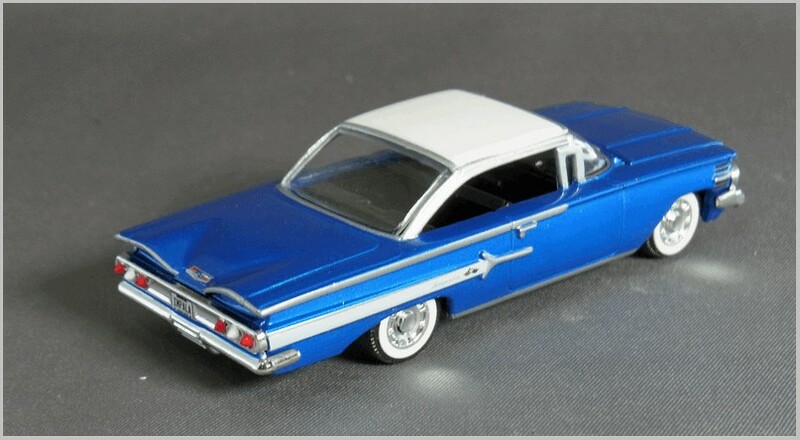 This is a model from the last year of the second generation Impala. The Sport Coupe is modelled here which featured a shortened roof line and wrap-over back window. Standard fittings included front and rear armrests, an electric clock, dual sliding sun visors, and crank-operated front vent windows. A contoured hooded instrument panel held deep-set gauges. The 1960 Impala models reinstated three round taillights on each side, and a white band running along the rear fenders. The side view shows that the casting is quite good, though I feel that the rear window may be slightly oversized. The side moulding with the rocket age embellisher also bears tiny printed Impala script and an image of someone waving the chequered flag so small magnification is needed to see it. The side ‘chrome’ is well printed though the front wing embellishment is rather over large, the four vents seeming much too obvious perhaps because the black sections are printed a larger than needed. The wheels and tyres are well done, in spite of the fact that the tyres are too wide, with the white walls matching some seen on real cars for sale in the US. The front grille is very nicely moulded and in a much shinier finish. Again a black wash has been applied to the grille and the light lenses are printed in white. There is no front number plate fitted. Along the leading edge of the bonnet Chevrolet has been finely printed where the full size car would have had the letters applied. And the centre of the grille has a badge fitted which has the figure with the chequered flag again. Inside we get the black plastic moulded tub with some detail in the steering wheel, dashboard mouldings and seats, and in this case on the door cards as well. To the rear the badging and lights are well done. A printed Chevy badge graces the boot though it is perhaps missing a printed dot below it for the boot lock. Again a nice shiny chrome effect rear panel is fitted and the moulded in lights are then accurately overprinted. The number plate to the rear simply says Impala. Play features are again restricted to an opening bonnet. It looks like the car is fitted with a standard inline six rather than the popular V8 option. Racing Champions Mint is a brand licensed by Round 2 from Tomy who acquired the brand when it bought Ertl. Round 2 are now re-using old moulds from Racing Champions and Ertl to create a Racing Champions Mint line. So the brand is now produced by the same company that makes AutoWorld and Johnny Lightning being run by the same people who originally ran Playing Mantis and revived the Johnny Lightning name originally devised by Topper. Products under this brand sit between the AutoWorld 1:64 models aimed at discerning collectors of 1:64 and Johnny Lightning which is the fun, play brand. They are all ‘3.25 inch models’ with some scaling out at 1:64 but others varying from the quite markedly. Looking on the web site it looks like releases have slowed in 2018 with the first release being based on racing cars which again seem to vary in scale considerably. Here we look at some of the cars released in 2017. 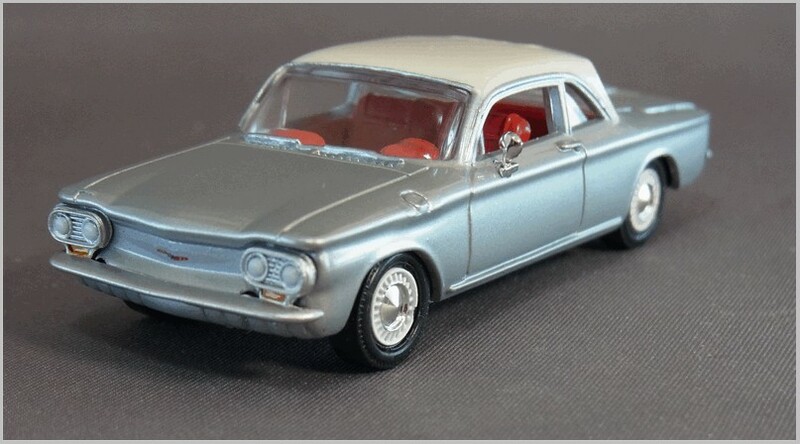 The photograph above shows the scale variation with the 1967 Plymouth smaller than a 1960 Corvair. Whilst nice models in many respects Racing Champion Mint certainly has a ‘fit the box’ approach. 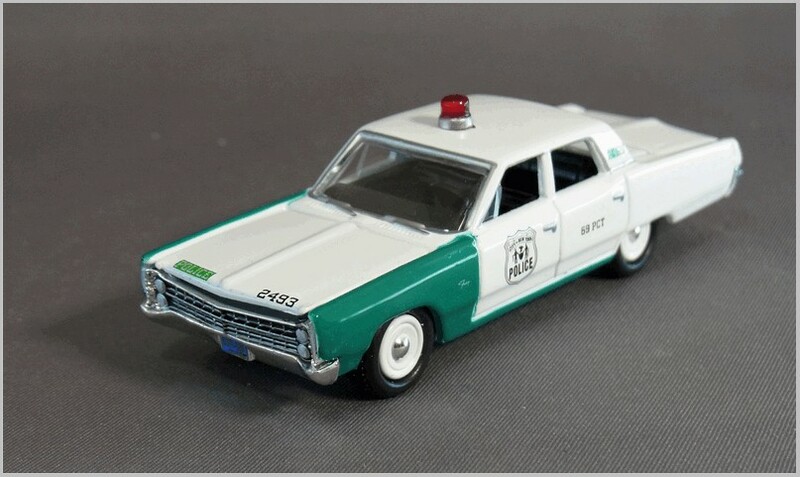 The model shown above is an attractive 1967 Plymouth Fury in the ‘America’s Finest‘ sub-range. The livery used is for New York City Police. Pictures usually show the dark green area extending all along the side but I am sure this variation has been researched by Round 2 as they also sell a variation with full length green paint. The Fury badge has even been printed on the wings which is a nice touch. Under the bonnet is a simple engine and as can be seen above the bonnet is a good fit and the front lights though painted on work well with the nicely moulded grille. Police markings are neatly printed and the rear lights, bumper and panel are neat mouldings. The somewhat heavy and square late 1960s shape has been well captured. Sadly the green painted areas were not masked well and there is a lot of feathering around the edges and they do not align completely with the door shut lines as they should. 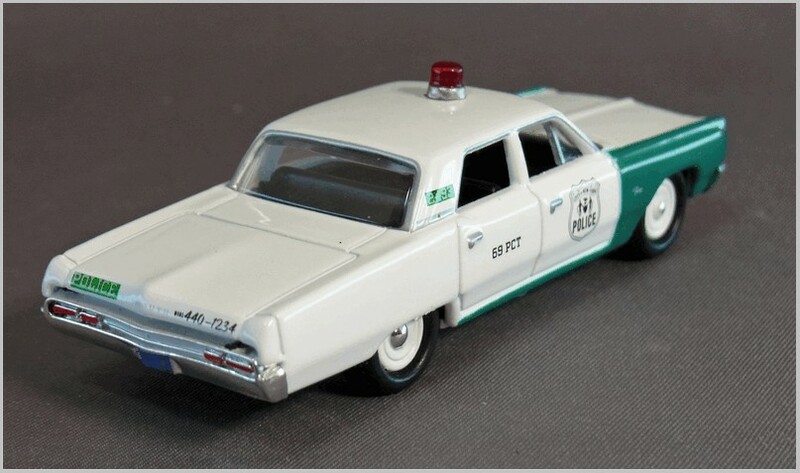 The wheels have the correct small hub cap fitted to police cars and a representation of the all steel wheels though the plastic used makes the wheels look much too shiny. Bigger in every dimension than the Fury this Edsel has no model stated though when you blow up the photographs the script on the front wing might read Pacer which was one of the smaller Edsels based upon the Ford chassis. Sadly the bonnet is ill fitting and sits above an Edsel horseshoe grille that is fitted at crazy angle. which makes the front look even more like it has been damaged parking. The two tone paint, chrome printing and badging are nicely done. With finely printed Edsel lettering on rear wings. To the rear the bumper is ok, if a little plastic in appearance and the rear lights are printed on with fine surrounds. The side view shows that the shape is neatly captured and the hard top nicely modelled. The top is in plastic presumably so the lower casting can also be used to make a convertible. A colourful engine sits under the bonnet but as usual with models this size lacking in detail. GMs attempt to get back sales from the imports from the likes of Volkswagen. A rear wheel drive car which was released after cost cutting measures had left it with a poor suspension solution leaving it suffering from tail heavy handling problems which lead to Ralph Nader’s ‘Unsafe at any speed’ statement. Though GM quite quickly resolved the issues the car was never the success they hoped for. 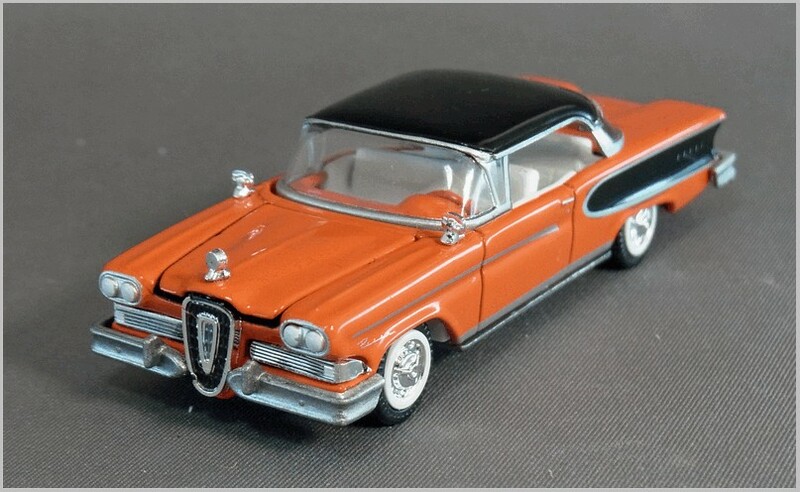 This model is consistent in size with the Edsel but rather larger than the Fury which in real like was nearly 10 inches wider. As the photograph shows the front lights are fitted crookedly bu here they can be twisted into a better alignment. 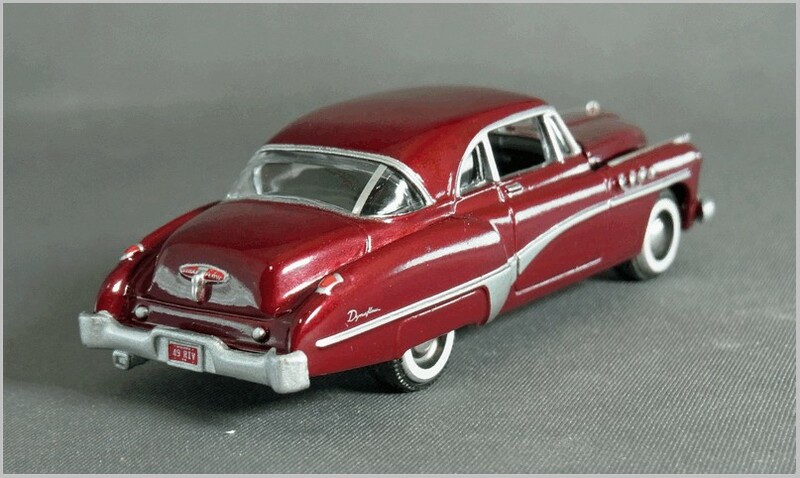 This is a model of the two door coupe which leaves a rather odd long rear deck, used for the hood on the convertible which looks more balanced. 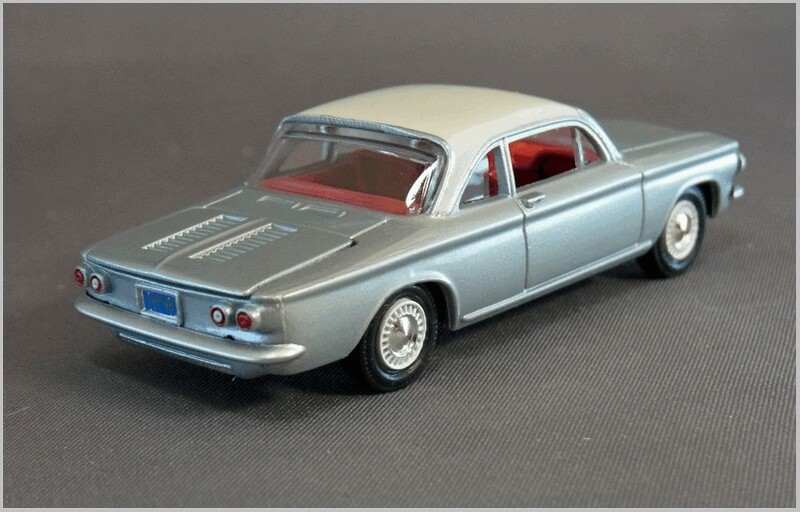 The model is nicely painted though the casting seems rather bland to me failing to capture some of the sharp lines the designers used to add variety to the cars surface. Rear lights are just paint on moulded casting extensions and the printing is not aligned well. The wheels are not really typical of the models I can see online but may be OK as many cars seem to be fitted with custom fake wires. At the rear we see the low mounted suggestion of an engine under to rear cover. The revival of Racing Champions makes available again some classic fit the box castings and few accurate 1:64 castings from Ertl days. Build and finish quality is only ‘so so’ even though these models attract a premium price in the US. 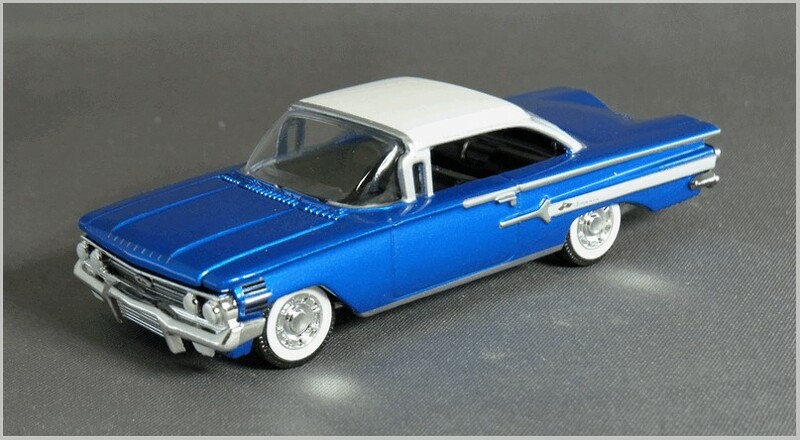 I am not sure whether Round 2 will invest a lot of effort into this range as it already has Johnny Lightning addressing the lower part of the premium market and Autoworld addressing the top-end of the US 1:64 premium market. For all their faults this series of models will please many who will otherwise have to seek out theses castings on the secondary market.